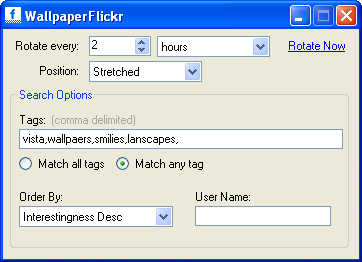 If you look out for wallpapers at Flickr, searching and saving them can be tedious.So here’s a tool called WallpaperFlickr that can get you wallpapers from Flickr based the tags you mention or based on the username. You can have it rotate the wallpaper at regular intervals, like once a day for example. This is useful tool for wallpaper junkies out there. Also someone may want to check this article written a little ago about John Backgroun Switcher. Jawwad @ Inspired Geek » Thats a really great tool, Thanks for sharing with us.